He relates his interest in such subjects from witnessing a traumatic event as a child, when he saw a young girl decapitated by a car. In his teens he befriended and photographed side-show performers at Coney Island and caught the eye of photographer Edward Steichen, who chose one of his early pictures for inclusion in the permanent collection of the Museum of Modern Art. After studying photography at college, he began experimenting, exploring how to change and age the image by bleaching and scraping the negatives, to achieve his dark and fantastical vision. Many of his prints are processed with coffee, tea and other pigments like selenium. Sometimes Witkin smears them with wax that is heated and polished, to make them resemble antiques. His tableau vivants or photo collages borrows for the Surrealists (ie Hans Bellmer, George Bataille), but Witkin aligns himself with painters such as Courbet, Seurat, Caravaggio and Dali. Above all, he sees issues of morality as central to his work. 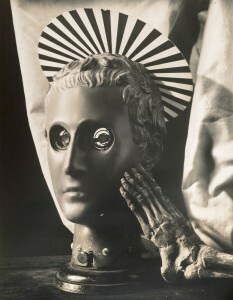 A recent documentary entitled Joel-Peter Witkin: An Objective Eye was released in July 2013, which shows the impact he has had on fashion, artists, designers and other photographers. But his work has always been controversial and many think his work is repulsive; he has often been called a pervert. Others, such as curator Germano Celant, see that his work lifts the taboos surrounding difference and disability; and challenges what is acceptable as ‘normal’. The love and courage it takes to find wonder and beauty in people who are considered by society to be damaged, unclean, dysfunctional or wretched. My art is the way I perceive and define life. It is sacred work, since what I make are my prayers. I’m a really happy person, but I think most people think I’m some sort of a monster. I’m intensely poetic, intensely sincere. I want to make a contribution to life and the quality of life, because I want to diminish evil and raise the possibility of goodness. I think that’s what every artist wants to do whether they’re totally conscious of that or not. I don’t photograph anyone who likes pain, only people who use it for their self-awareness. I have been approached by sadists who wanted me to photograph people they torture, but I refused, because I don’t like their purpose. The calculated madness of Joel-Peter Witkin’s photographs conveys a sense of 19th-century horror, like the dreamworks of the Symbolist painter Gustave Moreau… there’s a master of surrealistic photography at work. ‘Like’ is maybe not quite the right word – but I do admire the force or drive that creates this kind of work. Witkin offers an alternative viewpoint whether you like it or not, I am glad it exists; I am all for breaking down taboos and giving us access to talk about ‘difficult’ subjects. That was a well written and thoughtful article on Mr. Witkin. However, he is always fighting the misinformation that he was a war photographer in Vietnam Nam. He was in the army for 3 years but he never was sent to Vietnam Nam. He photographed for the army but he did not photograph the war.